It has been a hot sunny day today. After breakfast we walked along by the river and across the Charles bridge which was only just becoming busy with tourists and touts. There are many ducks in the river including some tufted ducks, the first I have seen on this trip. We found a so-called tourist office but most of these are really places where they sell you tickets to their own attractions. The man was very helpful but didn't have all the information we needed. We walked around some more and looked at the architecture which is beautiful in places although many locations are sadly in need of restoration. Back on the east side we found a Metro station and bought some tickets from a Mr. Bean wannabe. It took a long time to complete the transaction and he made a big fuss about breaking a 2000 kr. note which we had just got from a bank machine. It wasn't until some time later that we realized that he had undercharged us by 100 kr. We had seen an old four-wheel tram and trailer running through the city earlier and found the route of the 91 historic tram. None of the maps we had were helpful but we managed to get to the start of the run just before the first one. It turns out that the run starts at the Municipal Transport Museum which is also one of he car barns. 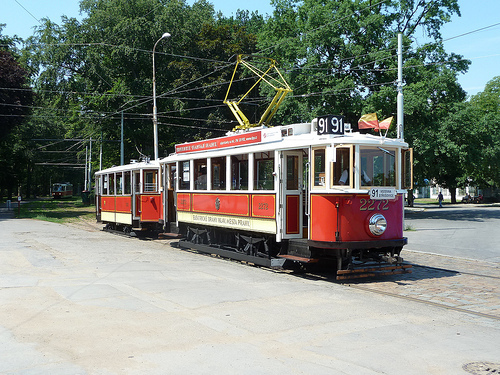 The tram makes an interesting route through the city and ends up at an exhibition ground in the north east. The cost was 35 kr. which is about $2.00. We had to pay another 35 kr. to get back and another 35 kr. to get into the Museum. This was an amazing deal - $6 for a tour of the city in a historic tram and entry into the museum where the trams are beautifully restored. In all, I saw at least three trams with trailers working the 91 route. There was a driver and conductor in the tram and a conductor in the trailer. There was a judicious use of the bells to communicate between the three each time before the tram started from each stop. If the tram had stopped at anywhere other than a stop, the driver gave two bells and didn't move until both had answered. There would then be a frantic unscrewing of the hand brake before the controller was opened. 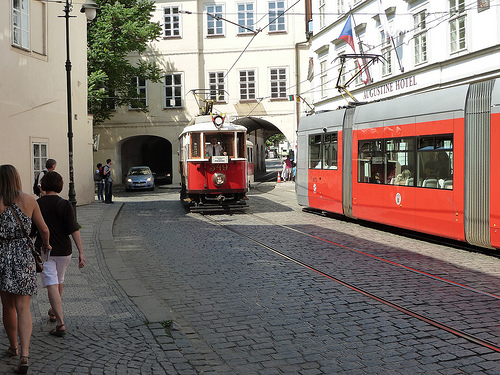 A #18 tram brought us back into the city and we found Wenceslas Square The whole area was infested with people right back to the Old Town Square. Pretty nasty. After a rest we walked through the Jewish section but found nothing of particular interest. Some buildings and structures are in imminent danger of collapse. Dinner was at the hotel restaurant where we receive a 30% discount. We started with marinated duck breast (Colin) and salmon and the main course was confitated duck with Bohemian dumplings (Colin) and pork with risotto. It was all very good indeed. We walked back out to see if things had quietened down a bit but it was still a mess. Of all the European cities I have visited Prague is by far the worst. It is populated by lager louts, df tourists and touts. Much of the infrastructure is badly in need of repair/restoration and the city is not doing enough of the basics. It would be good to see the streets cleaned. There is much broken glass around but nothing is done to clean it up. With the number of tourists coming here a hotel tax might make sense with the revenue being used to clean up the place. Much of this is a result of many years of Soviet influence. There is a don't care attitude on the part of the locals. Even the main dining area of the hotel is not swept out. Many of the bars and restaurants are dark, dingy and dirty – they are selling this as an experience rather than make the place look a bit presentable. One gets the impression Czechs revel in dirt and filth. The whole place is disorganized in a laisser faire manner. There are many Tourist Information Offices all displaying the green letter “I”. In Austrian cities there is one city tourist organization that may have several branches but all with the same information. In Prague there are many such offices dotted all over the city, but only one of which calls itself “Official”. All produce information but it varies according to what that particular office is trying to sell. There is an official Metro map but it doesn't show the streets. Other offices produce street maps but they only show the Metro and tram routes that suit them. We finally found a street map at the Official Tourist Office that shows the Metro and tram routes but you really need a magnifying glass to read the route numbers. Another example of where the city has just let things go.